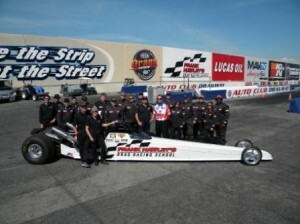 For 28 years Frank Hawley’s Drag Racing School has been the leader in drag race driving instruction and licensing. Thousands of bracket and class racers and many of today’s Pros are on the graduate list. This year the school has added a new program, the Dragster Adventure. The Dragster Adventure puts drivers behind the wheel of a real competition-styled 230” wheelbase dragster and lets them race in “side-by-side” competition! 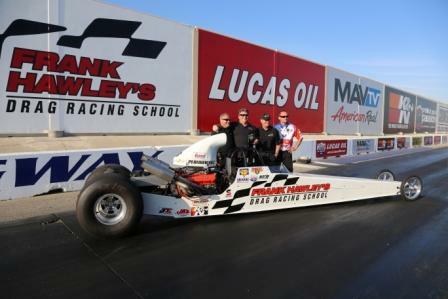 Unlike the cars in Hawley’s well-known “Licensing Programs” which require a medical and two days of instruction, the Adventure Dragsters are powered by ZZ454 Chevy big blocks which are a milder version of the school’s 572 c.i. competition engines. However, even the ZZ454s are a little too powerful and to keep the cars away from 9-second runs, as per NHRA licensing requirements, the engines are throttled back to produce 10-second, 130 mph performances. But don’t think for a minute that these cars aren’t fast…they’re really fast! The design of the cars, allows students to get up to speed in a half-day course and if they choose to, enter into ‘side-by-side’ eliminations in the afternoon. So when Frank invited me to do some racing at the Media Challenge, I jumped at the chance. The race was at Auto Club Dragway in Fontana, CA which was re-opened this spring. I joined a number of other journalists for the one-day course offered by Hawley. The event was to promote both the re-opening of the Auto Club Dragway and the return of Frank Hawley’s Drag Racing School to Southern California. To add a little excitement to the race and to give some folks much needed advice, Hawley invited John Force Racing driver Robert Hight and Don Schumacher Racing driver Jack Beckman (a veteran Hawley school instructor), as guest instructors. 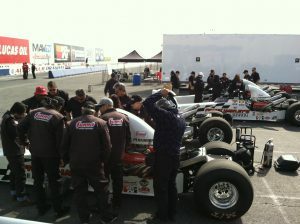 Nitro FC racer Jeff Arend, a sales rep for Hawley, joined in to help coach the media. It all sounded like great fun, but these are very quick dragsters and just like you wouldn’t put a neophyte in an aircraft with no instruction, the same is true with these dragsters. First, we spent an hour or so with Frank in the classroom going over the intricacies of how to drive his dragster, then we moved outside where we were fitted with helmets and the all-important safety gear and driving suits. Finally, we learned how to get in and out of that tight cockpit so at least we looked like a 20-year veteran. Once we had the basic instructions committed to memory, it was time to drive the cars. We first had to perform a burnout, stage the car, react to the ‘Tree’ and make an 1/8th-mile pass. Once we’d managed that successfully under Frank’s and the rest of the coaches watchful eyes, we returned to make a full quarter-mile run and prepare for qualifying, which would be based on Reaction Time. The format for the race was a .500 Pro Tree, and a handicapped start with dial-ins. 5.0 Mustang and Super Ford magazine’s KJ Jones hit a perfect 0.000 reaction time to take the top spot in qualifying. On the other end of the field was Car Craft’s Douglas Glad who red lighted and therefore found himself at the bottom of the ladder. Using a Pro ladder, this placed Jones and Glad against each other in the first round. The rest of the field also paired up based on their qualifying times. Although we were given instructions on dialing the cars in, each participant had to choose their own dial-ins. There were a few variables to consider including the drivers weight, the order the cars ran, temperature changes and more. Both Beckman and Hight helped their respective teams figure out how to negotiate the dial-ins based on each car’s previous best e.t. The first matchup promised to be exciting as Glad had to take on top qualifier Jones. Both reaction times were within 0.005-second giving KJ the ever-so-slight advantage. KJ slowed only 0.008 against his 10.62 dial-in which seemed close enough to deliver the win, but Glad nailed his, running right on his 10.78 dial to take the win. First round also saw several racers forget to pull their shift lever back into First gear after the burnout, which meant the car left in high gear. Among the victims of this oversight were the author, Henry De Los Santos, and at least one other. Racer Alex Rogeo looked good in her first pass with an impressive 10.45 on her 10.44 dial-in. This was impressive given all the variables, but she has lots of bracket racing experience so she knows the bracket game well. Hot Rod’s Elana Sherr transitioned to the second round as did Camaro Performers’ Nick Licata, Vette’s Steven Rupp, Speed Scene Live’s Donnie Couch, and Car Craft’s Douglas Glad. Alex beat Elana in the all-girl race when Elana broke out after pulling off an excellent reaction time advantage, Couch put Calin Head out with a great start, and Rupp beat his buddy in an in-house duel when Licata redlighted. For the semi-final round, Glad met Alex the Car Girl. Glad nailed the ‘Tree but slowed against his dial-in giving Alex the win light when she ran dead on her 10.32 dial-in. That produced the closest race of the event with a 0.023-second margin of victory. On the other side of the ladder, Couch bested Rupp when the ‘Vette editor gave away a 0.063-second advantage on the starting line when he slowed against his dial-in. This gave us the final round of Alex The Car Girl versus Couch The Big Guy. Couch got the slower dial-in head start and both cut lights within 0.016 with Couch taking the advantage. Alex had been living on the edge of her dial-in all day and the gamble finally caught up with her when she broke out by a scant 0.020-second but it was enough to give Couch the win and the champion’s trophy. Hawley’s Dragster Adventure program is an absolute blast. 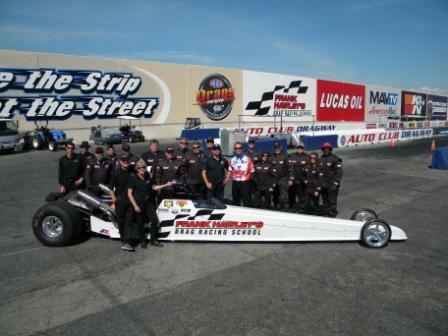 It is the only place where you can learn how to drive a 130 mph dragster and race it in competition in one single day. Hawley takes this program around the country to various tracks and it’s the perfect way to spend a day with your friends or for a company outing. Check the school’s website www.frankhawley.com and see when they’ll be in your area. Thanks to the Hawley’s and the staff for a great day!